Chieftain Fabrics offer the ultimate in stain resistance and cleanability. The colours and patterns within our ranges have been chosen with this in mind. All of our ranges have been tested and are capable of withstanding the most rigorous cleaning regime. Our fabrics can be used with all NHS approved cleaning solutions such as Chlor-Clean, Haz-Tab, Milton and Tristel. Wipe clean regularly with a microfiber cloth and warm soapy water to remove dust particles and light soiling. If spillages occur, remove promptly with an absorbent dry cloth. Where disinfection is necessary, clean with a solution of disinfectant specified by the manufacturer with a damp cloth. 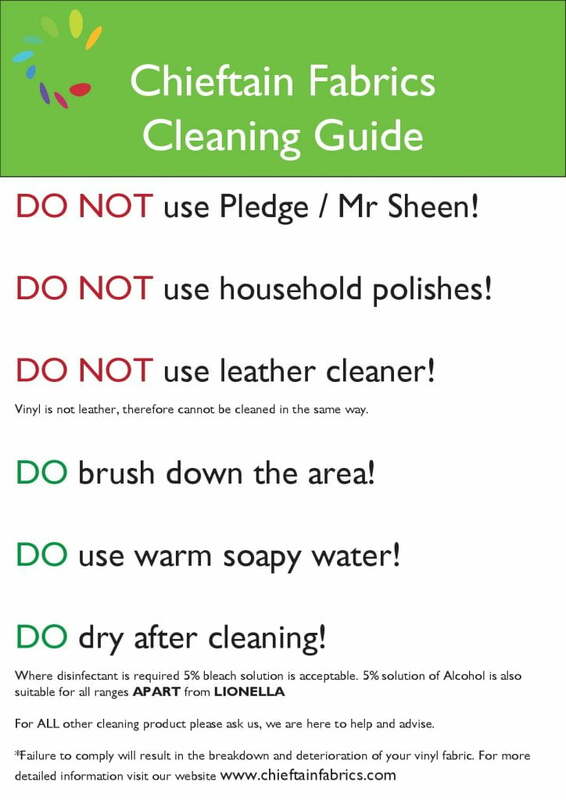 When using bleach, a 5% solution (50,000 ppm) is acceptable. A 5% solution of Alcohol is also suitable for all ranges apart from LIONELLA. Follow this with a clean water rinse and dry with a soft cloth or towel. For heavy or ingrained soiling follow steps 1 & 2 above, then scrub the affected area using a soft brush and warm soapy water, followed by a clean water rinse and dry. The use of oils, solvents, abrasives, synthetic detergents, wax polishes, leather cleaner or aerosol spray is not recommended. Do not machine wash or dry clean vinyl fabric. Do not use felt tip or ball point pen to mark as this will cause permanent staining. Remove indigo dye from denim and canvas garments immediately as they will produce permanent staining if not dealt with promptly. Using cleaning products contrary to the manufacturer’s instructions may compromise the integrity of the fabric. Unsuitable cleaning products will remove the lacquer layer which protects the vinyl fabric and result in hardening and/or cracking of the fabric. This may forfeit your warranty.